After two uneventful, yet sleepless, flights, Dave and I touched down in Roma. 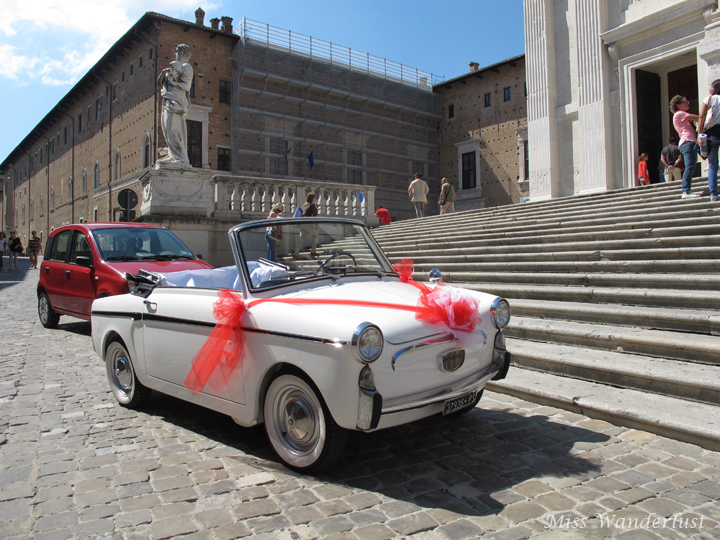 Although the trip from our door to the airport in Rome was 17.5 hours, we decided to rent a car and hit the road right away to get to San Marino, where we were spending two nights. Even though I grew up in an Italian-speaking household and have been to Italy twice previous, for the first time in my life, in a McDonald’s in Fiumicino Airport, I had a full conversation in Italian! It wasn’t much, but I was proud of myself. (I’m also not proud that my first meal in Italy was at McDo, but those Crispy McBacons are too hard to resist.) My level of comfort in foreign countries and with foreign languages has grown exponentially over the past few years. To set the precedent on this trip, we didn’t end up receiving the rental car we reserved. Haven’t these people seen Seinfeld?! Instead of the small hatchback we reserved, we ended up with an absolutely ridiculous Nissan Juke, but whatever, we wanted to get to San Marino. For some reason I thought the drive from Rome to San Marino was about 2.5 hours, but it was actually more like 4.5. We headed north and slightly east, at first on the speedy Autostrada, but eventually off onto secondary roads through absolutely gorgeous countryside, through the regions of Lazio, dipping into the edge of Umbria, through spectacular Toscana, and finally into Emilia-Romana. It was the definition of picturesque, exactly what people think of when they think of the Italian countryside. Rolling hills, stone houses, red flowers, vines climbing up the sides of buildings, the sun. How I would love to live right there. As we got closer to our destination, we saw San Marino in the distance, perched on the top of Mount Titano. Anticipation growing as we traveled the windy roads, we wouldn’t have known we went from Italy into another country unless I was looking out for a sign, hopefully showing the UNESCO World Heritage symbol. We climbed and climbed the mountain in our silly mini SUV, trying to focus on the road but getting distracted by the increasingly great view of Italy surrounding us. Once we made it to the top, we parked away from our hotel as cars aren’t allowed to drive in the Old Town between 10:00-19:00. We arrived at our hotel around 17:00, freshened up, and went back out. Grabbed the first of many, many slices of pizza of the trip and took a stroll around part of the compact Old Town. The town is gorgeous and so are the views. It is very clean and well taken care of. I saw many people in my short two-night stay cleaning their storefront windows with extreme care, and there wasn’t a drop of garbage on the ground anywhere. Beautiful cobblestone lanes lined with more stone buildings covered in vines. There weren’t too many people, and even the tourists seemed high end for the most part. The hotel was nice and breakfast was great, but the bed was so incredibly hard, I might as well have slept on the floor. For as many Euro beds as I have slept in, I still don’t think I will understand why they are all so hard and why people seemingly enjoy sleeping on them! 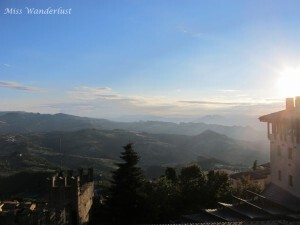 Even though San Marino is an independent country, and the world’s oldest republic at that, many people still think it is just another part of Italy. And even though you just drive across the border like you’re driving into the next town over, you can drop into the San Marino Tourist Info office and get a souvenir passport stamp for 5 Euros. 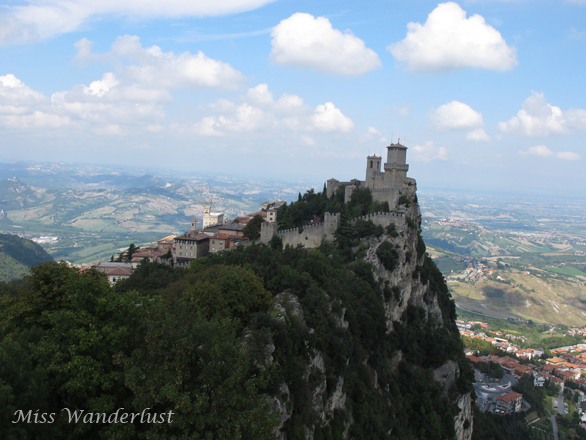 San Marino’s most famous and iconic sights are The Three Towers – one on each of Mount Titano’s three peaks. The First Tower is the oldest, originally constructed in the 11th century. The Second and Third Towers are from the 13th and 14th centuries, respectively. We hiked up to the First and Second Towers and took in more incredible views and got our fill of exercise for the day. The Third Tower isn’t open to the public, so we didn’t bother with the hike over there. We took it easy for the rest of the day, eating, admiring hang gliders, drinking wine on our terrace and playing Scopa. On our first trip to Italy in 2008, there were two young guys across from us on the train that were playing the card game with bizarre looking cards that we had never seen before. We later found some at the Italian market in Edmonton and learned to play ourselves. Never would have thought we’d be playing that same game ourselves in (sort of) Italy ourselves one day. The next morning we took another leisurely stroll around town before hitting the road again. 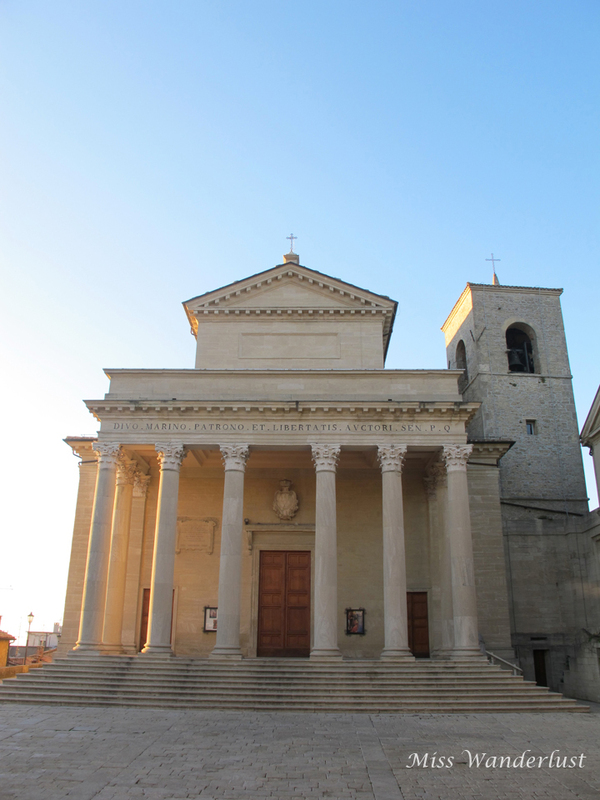 Our end destination was Ancona, where we were to catch an overnight ferry to Split, Croatia. 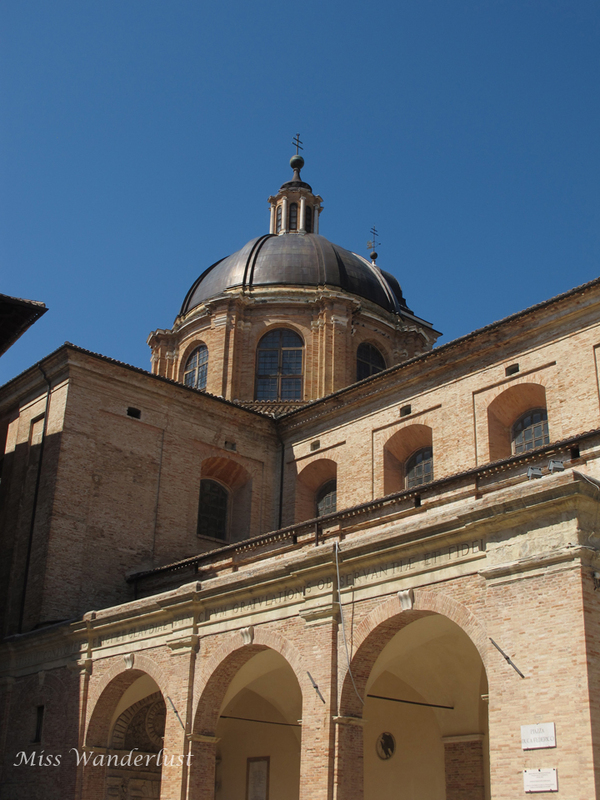 The UNESCO World Heritage site of Urbino, Italy was sort of on the way, but not very far out of the way, so we made a detour there to check it out. The Historic Centre is a remarkable walled city, which “represents a pinnacle of Renaissance art and architecture”. The fact that Urbino is not on the beaten tourist path makes it all that much more appealing. It is rich in history, culture and beauty, but it is also a university town and there are not nearly as many tourists as other comparable cities in Italy that are on the regular tourist route. Makes it feel a little more special, like we had it almost all to ourselves. We spent about three hours in total exploring the old town, including stops for pizza and delicious gelato. There was a wedding going on at the Cathedral that day, a Saturday. 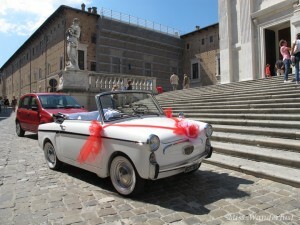 There was a cute little vintage white Autobianchi with red ribbons parked right out in front. I’m normally at least a somewhat cynical person, but for some reason weddings break me down. We waited outside just to watch the bride and groom come out. All of their friends and family were waiting outside the big doors, ready to throw confetti and rice at them. I admit it, I was a little verklempt. What a beautiful place to get married, on such a beautiful day. 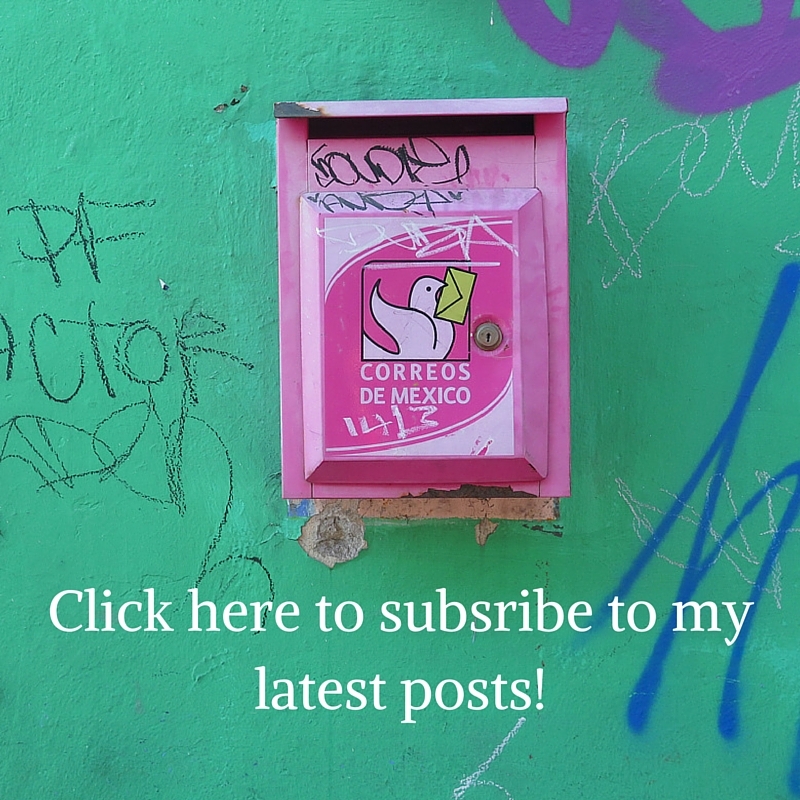 Next up on Miss Wanderlust: My first experience on an overnight ferry, and Split, Croatia. San Marino looks beautiful. I love the way you write giving us the history and geography, but adding your own personal touch to keep us interested. Very nice Karlie, can’t wait for your next story! Great post and beautiful pics! Especially love the first one. Gorgeous. Italia, a beautiful country with great folks. But, I would reconsider travelling there and driving around unless I was sure I was going to get an Alfa Romeo…well, at least a Fiat. Actually, kudos for driving there. I’ve driven in many places around the World, but one place I would not want to would in Italy, and Rome in particular. Makes driving in Paris look like a piece of cake.